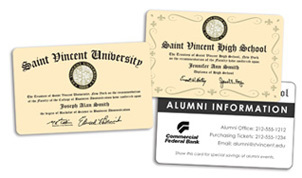 Give alumni the Mini Diploma, a unique pocket sized replica of the School's or University's actual diploma. It works as a reminder of that special day and increases loyalty to their Alma Mater. The front of the card, just like their diploma, features their name and degree. The back can be customized to have alumni information, a Bar-Code or a Magnetic Stripe for events, fundraisers, etc.